Surgery Day: Roxanne and I get to the hospital yesterday (Friday) morning and staff efficiently process me through admissions, to changing into a trendy hospital gown, to asking questions (aided by Roxanne since I can somehow partially read her mind, along with lip reading), to signing forms that clearly state that I understand the unlikely dangers that I may encounter as a result of this surgery. One key thing to post for posterity is the information relayed by the nurse when Roxanne and I were waiting in the pre-op room. And I quote, “you are not allowed to do any chores, housework or dishes for four months… and that is four 31-day months.” Well, being the stickler I am for following orders (when they suit me) I looked at Roxanne and said, “did you hear that?” She gave me one of those “ha ha ha” smiles knowing that the nurse must have been kidding. Then comes in the anesthesiologist and asks questions, etc. and finishes off by saying quite clearly and closely that, “you are not allowed to do any chores, housework or dishes for four months… and that is four 31-day months.” I smiled at Roxanne and she smiled back in a less than convincing way. Off to operating room. No pictures thank you. If you want to see gory cochlear implant operations just Google them – there are more than enough images and YouTube videos out there showing the operation in gritty detail. Well, the surgery… heck, I don’t know how the surgery went! They gave me general anesthetic and before I knew it I was waking up in the post-op room and feeling quite good! The nurse wheeled me back to the recovery room where Roxanne was waiting for me. She told me later that I was acting silly and kept talking… I’ll leave that for her to tell… At any rate the nurse asked if I needed anything. I told her I was VERY thirsty! Oh, by the way I was reading her lips since I am now completely deaf (I’ve been deaf in my left ear since age five and now with the operation I can no longer hear anything in my right ear – but that’s OK because I couldn’t hear hardly anything anyway). Back to present – the nurse brought me a cup of apple juice with crushed ice and I must say that it was without a doubt the best tasting apple juice – EVER. Yep, as you can see from the photo I have a “Princess Leah” bun on my right ear. What became of the other bun I don’t know but I suspect Jabba the Hutt had something to do with it… (I am still on pain killers as I write this blog and feel just fine…). I don’t really remember the rest of the day too well. The operation was three hours long and we left the hospital around 4:00 PM in keeping with it being an outpatient procedure; which was OK by me since I was feeling just fine. Roxanne drove me home. My youngest daughter Emily was out in the front yard playing with our new puppy (yes, we got a new nine-week old puppy two days before my surgery in keeping with our insane household mentality that merits a post for another day…). I went right upstairs to the bedroom, hopped into bed and smiled at Roxanne – she is the best. After school, my middle daughter Abby came in followed by my son Ethan. My oldest daughter, Marie, is at college now but will be coming over to see me this weekend! My first posts have been rather long. fear not, all my posts won’t be this wordy (I hope…). Over the next three weeks my head will be healing and then on November 12th the audiologist will “turn on” the cochlear implant. 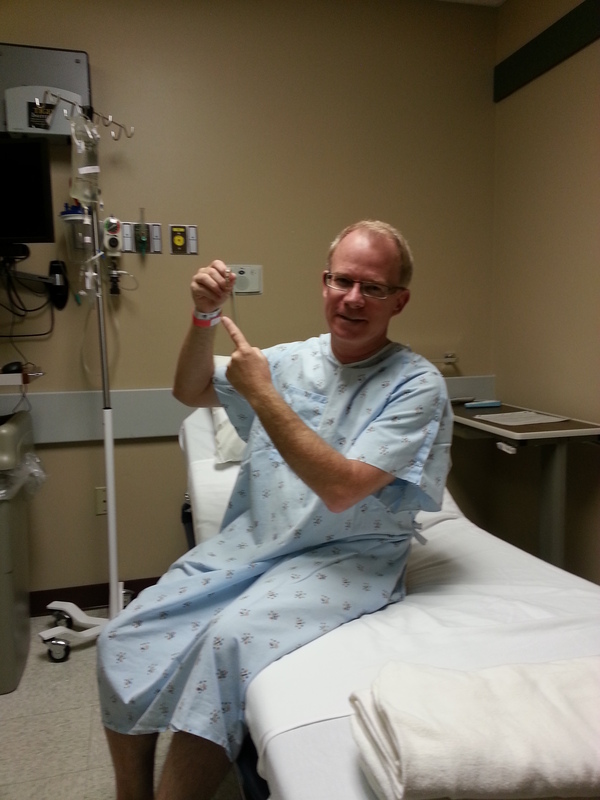 In the meantime I will regale you with stories that led up to getting this operation. One final picture below of me here in my Den this morning. Note: I am pointing to my glasses. Specifically, I am pointing to the part of my glasses where I removed the bow (or arm) because the “Princess Leah” bun is too big! Finally, thanks for all the well-wishes and positive vibe messages sent my way. I am really blessed to have such wonderful family, relatives and friends! This entry was posted in October 26, 2013 on October 26, 2013 by Chris. So glad all went well! I like the Princess Leia look-very stylish! Following and enjoying the blog! 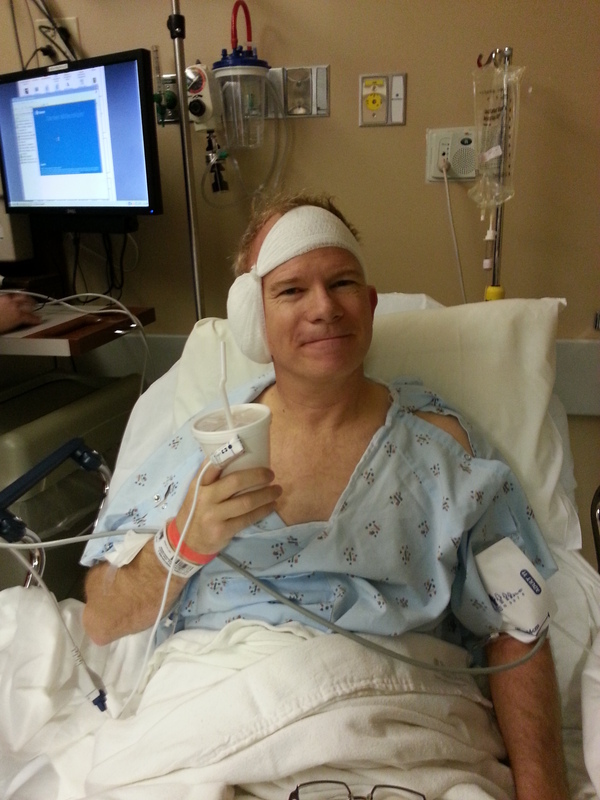 Hey Chris – glad to see your smile and good spirit after the surgery. We’ll have to have Roxanne tell us more :). What about the ringing noise? Is it gone? Ringing is still there but to be expected right after surgery. I don’t know if it will be there long term! Chris – glad everything went so well. You think you look like Princess Leia, but you should be claiming to look like Ralph Macchio (Karate Kid) when he puts on the headband to fight. Now your challenge is to stand on a post on one leg and catch a fly with chopsticks! Good idea! Let me go try that right now since Roxanne isn’t home! Congratulations! Love reading about the journey. You are probably quite excited as you should be. Will be life changing. On the other hand, it is a terrible price to pay just to be able to hear…I mean…no chores for 4 31 day month?? OMG! The sacrifices you are making! So brave. That’s all I have to say. So brave. I know, I know! What price glory? On another note, I didn’t go through this to whole thing to now hear words like “can’t” or “won’t” or “impossible” …! Glad you are in good spirits. Finally, your chance to be princess Leia! Enjoying the blog. Love you brother. Hey Sis, I never wanted to be Princess Leia, I just ended up with her bun! 🙂 Wait! 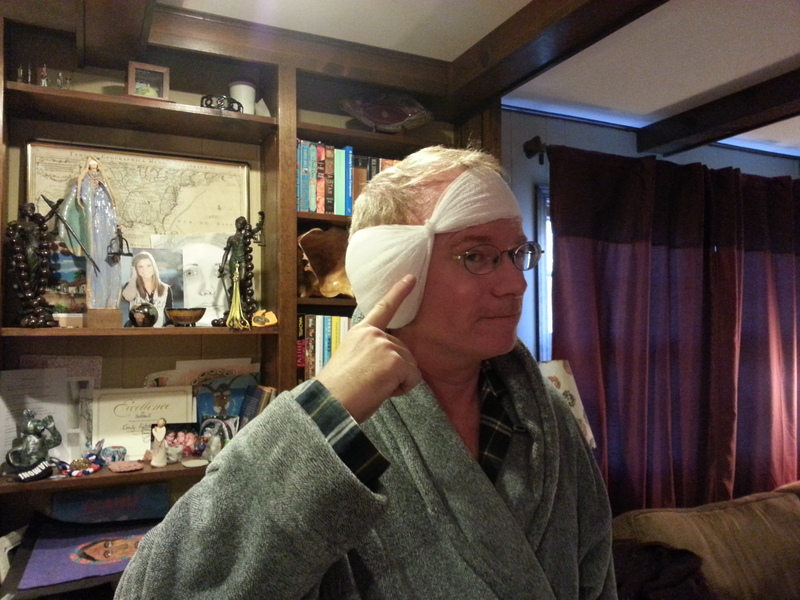 I was thinking me being more like Han Solo with Princess Leia’s bun… Yeah… That’s right…!